Our Wooden Serving Planks make a welcome gift, as they look and feel good, are comfortable to use and won’t dull knives. 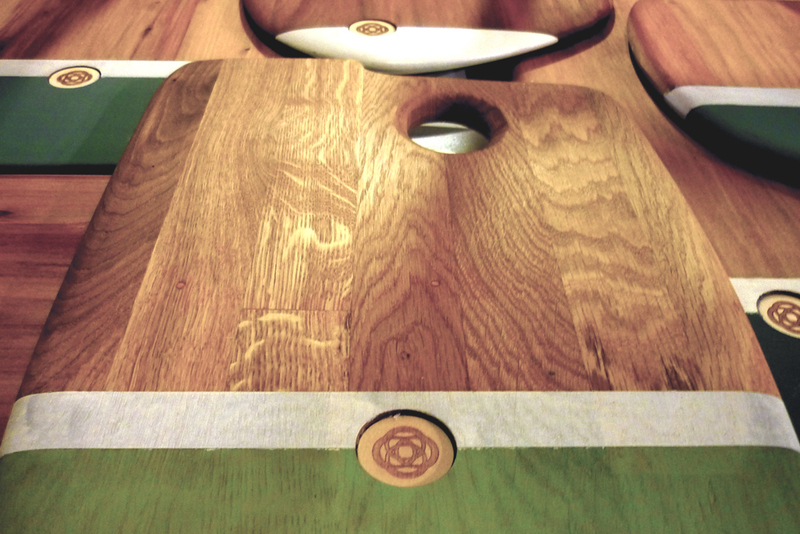 Handcrafted in Leicestershire, UK these visually appealing handmade boards are finished using milk paint colours that celebrate the glory of vintage and retro style. Though use and wear these planks will continue to look unique. You can bring an accent to your kitchen by leaving our good solid wooden planks on the countertop. This is a classical type of serving board with a twist. The inspiration came from the very useful tool the artists palette. Like the palette, you insert your thumb through the hole, then curl your fingers around the edge, using your forearm to support the weight of the palette. The plank distributes the weight between the hand, rear forearm, and body providing balance and comfort. This significantly reduces stress on the hand, wrist, arm and shoulder with a universal fit for all body sizes and suitable for both the right handed and left handed. The planks are smooth to the touch through the process of hand planing and sanding of the edges and thumb hole. Finished in durable satin oil finish that is resistant to water and an all natural Milk paint that penetrates the wood like a stain meaning it will never chip or peel. Milk paint is made entirely of natural and safe ingredients and contains no VOC’s. A traditional finish that has been around for thousands of years, milk paint was found in the pyramids in Egypt and on ancient cave painting having been used in America since the Shaker period on furniture. Our wooden Planks are strong and durable if you maintain them properly. Made of attractive recycled timbers a good, a sharp knife will cut into the wood to some degree, so be forewarned that the cutting surface of your elegant wood serving board will look worn, especially if you are heavy handed. Our Planks have been finished in a Mineral Oil and is a popular choice to keep your board well maintained. Oiling the wood will prevent them from becoming too dry and splitting over time. Apply a layer of food-grade mineral oil to the surface at regular intervals. Apply the oil, coat liberally, let sit for several hours then wipe off excess. A light food grade mineral oil is a good preservative for wooden cutting boards as it helps keep water from seeping into the grain. Alternatively, you may also use a food grade drying oil such as Walnut Oil, which is applied in the same manner as mineral oil. The advantage of walnut oil is that it actually dries after a day or two, whereas mineral oil never completely dries. Both finishes however are easily renewable. The Plank should be treated with oil when it starts looking dry to prevent cracking. A standard recommendation is 5-7 times a year, or as needed. An old adage for treating a new serving board is: oil it once a day for a week, once a week for a month and once a month for life.